Before I get started on the story, I think it’s worth noting that this hefty volume has an interesting (ahem) ‘Foreweird’ by Michael Moorcock and an introduction by Ann and Jeff Vandermeer. Moorcock is, of course, well known in SF/F, though I have to admit that I’m far more familiar with his fiction than with any criticism that he has done. Ann and Jeff Vandermeer are also well worth listening to on the subject of weird fiction (or, indeed, any fiction). Plus, I urge you to read some of Jeff Vandermeer’s own novels. I know that not everyone is inclined to read forwards, but I think it is worth taking the time in this instance. Anyway… to the story. One of the things that I was looking forward to before starting this was that though there are plenty of writers with whom I am familiar (Angela Carter, Franz Kafka, Gustav Meyrink, James Tiptree Jr. and so on…), there are many whose work I have, if that, only heard of in passing. Therefore Alfred Kubin’s The Other Side is one of the stories to which I was looking forward. Kubin was noted for his paintings and drawings which were considered important examples of Symbolism and Expressionism. He also provided illustrations for Edgar Allen Poe. His story, The Other Side is an excerpt from a longer novel (of the same name) written in 1908. If I have a criticism of this it has little to do with the choice of story or the story itself. I just wish that there were more of it. I shall certainly be trying to track this one down. The Other Side is set in a city named Pearl. The story opens with a sleeping sickness which, though never explicitly stated, seems to be linked with the political situation in Pearl. This is a dystopian work of weird literature. There is the sense that in succumbing to the embrace of sleep, the people can escape the oppressiveness of the city. The weirdness spreads its ragged wings further as the sleeping sickness allows a free reign to the animals of the Dream city and as folk awake to find that they are facing swarms of insects and, terrifyingly, many rabbits in their beds. The idea of the encroachment of the dream world into the real world reminded me a little of Gustav Meyrink’s Der Golem, which is, of course, no bad thing. Though I should note that this (along with most of Kafka’s work, with whom Kubin is compared) was published after The Other Side. The story moves beyond this and the tearing down of the walls between realities is joined with what feels more like the destruction of reality itself as the fabric of the city – its bricks and mortar – begin to crumble away, The excerpt ends – tantalisingly – with the narrator recognising his own ephemeral nature and rushing to … well, we don’t really know. Kubin’s entry in this anthology is clearly part of an excellent piece of art. Paul Smith’s piece on the full novel further whets my appetite (and helps to put the events of this excerpt into more of a context for me). Despite it’s brevity and the hints that there is much more going on, this is a good start to the anthology. Onwards! 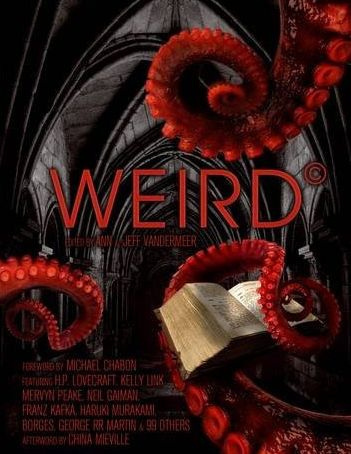 By the way, Maureen Kincaid Speller has started writing about The Weird, too. I suggest you check her pieces out. This entry was posted in Review and tagged alfred kubin, ann and jeff vandermeer, the weird. Bookmark the permalink.